Mohammad Al Qassab creates art that defies order and preconceived ideas of colour. Through his work Mohammad’s abstract creations create multiple horizons of white and intense color that create grid like structures of expanding and contracting spaces and vibrations. For Mohammad, colour takes on a different meaning and significance from one culture to the next in accordance to customs and ways of handling them. Preconceived ideas of how colours should be coupled and placed are turned over in favor of spontaneity and intuition. At first glance, his work appears chaotic and haphazard, but within chaos there is structure. Circles, squares, lines, dots and other non-specific forms appear whether or not the movement is spontaneous. With atom-like quality the brush strokes converge to create shapes of their own, altering the density of each intersecting space and line. Mohammad Al Qassab is a member of the Emirates Fine Art Society and is an active member of the board, keen to support upcoming artists of the UAE. 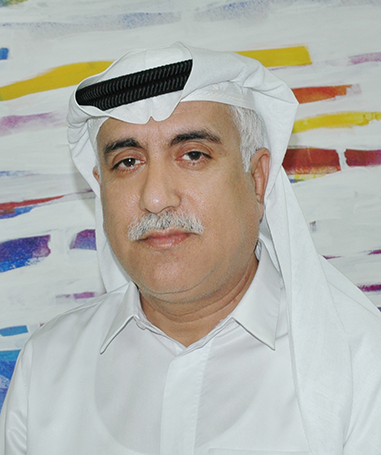 He resides and works in Sharjah and has participated in exhibitions within the UAE and abroad such as Kuwait, Bahrain, Korea, Italy, India and much more. For his artwork in Capsule Arts limited edition art prints, Mohammad Al Qassab will be featuring his abstract paintings from his 2009 and 2013 collections available to purchase at capsulearts.com, for more details about his featured artworks and the launch collection sign up here.